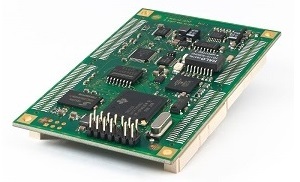 The D.Module2.C6747 is based on the Texas Instruments processor TMS320C6747. It is characterized by low power requirements and a broad range of data acquisition and communication interfaces. The D.Module2.C6657 is a perfect choice for industrial control and measurement. The large number of serial McASP channels for example facilitates building multi-channel, high resolution, synchronously sampled data acquisition systems, as used in vibration monitoring and analysis. A host PC can be connected via USB or Ethernet.